I was bemused as to why she was only given twenty-five minutes, especially as there was a fifty minute change over with no stage to set up. Michael Bolton took to the stage with screams of delirium from the largely female audience, though I was surprised to see the venue only approximately two-thirds full. 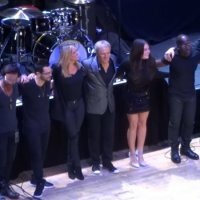 The sound was crystal clear, and although Bolton seems to have aged quite a bit over the last few years, and did not move around the stage with as much vigour as he once did, he still possesses a wonderful voice. He started the show with no less than three consecutive covers, 'Stand By Me', 'To Love Somebody' and 'Sittin' On The Dock Of The Bay', which, to be honest, is one song that Bolton has almost made his own. It is his own material, however, which gained the loudest audience response, starting with 'Said I Loved You (But I Lied)'. The crowd singing throughout the whole evening was very impressive, and in tune. We were soon back to the covers with Eddy Arnold's 'You Don't Know Me' and the Marion Montgomery oldie 'That's Life', which Bolton said had been done best by Sinatra; but, he'd obviously forgotten the classic Diamond Dave version. The Dylan penned 'Make You Feel Your Love' preceded his own 'How Am I Supposed To Live Without You', when once again, the atmosphere notched up a level in the auditorium. Unsurprisingly, Bolton has surrounded himself with a host of superb backing musicians. He invited the excellent Sam Fly to the front of the stage to duet with him on 'Ain't No Mountain High Enough' and the David Foster penned 'The Prayer', which was sublime and definitely the most impressive of the cover versions played this evening. At the start of the Percy Sledge classic 'When A Man Loves A Woman' Bolton reappeared in the centre of the downstairs stalls. He was immediately surrounded by adoring female fans; there has not been as many wet knickers in Sheffield since the flood in the Meadowhall M&S lingerie department. Bolton covered most of the musical genres from his long career, but sadly neglected his Hard Rock era. The latter was a shame as the crowd really got up for the up-tempo Soft Rock numbers like ' How Can We Be Lovers' and 'Steel Bars', so I'm sure one or two Hard Rock songs from his repertoire would have been a welcome addition. 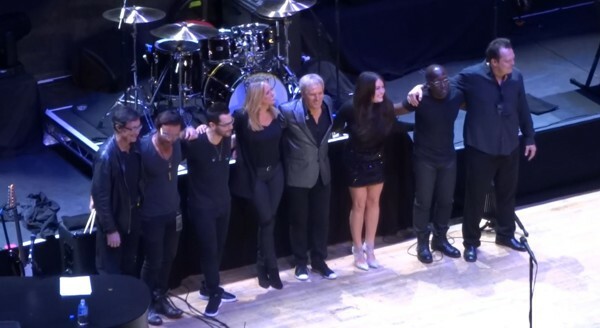 Before the final encore of 'Time, Love & Tenderness' to conclude the ninety-minute set, Bolton introduced his very talented backing band (also Ashley Locheed on backing vocals). They all duly took the deserved applause at the end of the show.